attention and creates awareness about organ donation on the global scale. the ceremony will be announced. 1. 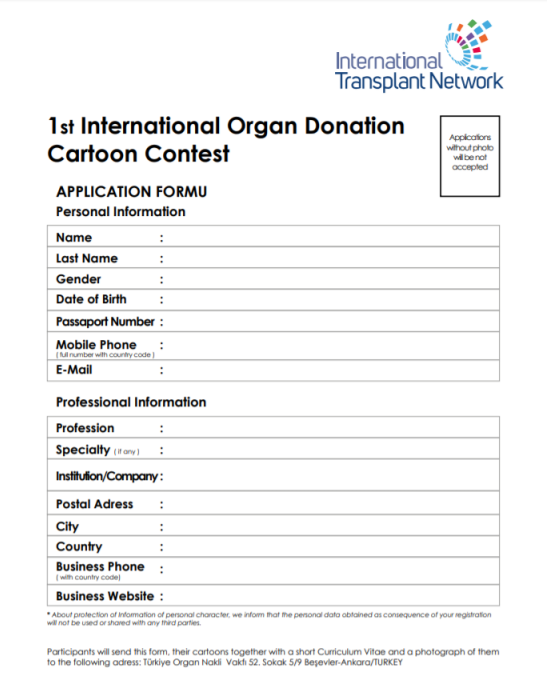 Participants will draw about organ donation. sent as printouts should bear original signatures of participants. Photographs, photocopies, etc. will not be accepted. 3. Size of cartoons should be A3 (29,7 x 42 cm) or A4 (29,7 x 21cm). shipment firms will be announced on the website. that may occur during postage or for any late delivery of cartoons. 7. Award-winning cartoons will not be returned to participants. other media and to use them in any other way without any limitations. transactions with third parties in relation to transferred financial rights. issues before participating in the Contest. encouragement prize competitors for the award ceremony. act as a jury member.